A much smaller island at a much slower pace – and cheaper than Mykonos. Main meals on Mykonas €10-23 unless you want lobsters etc then around €90. 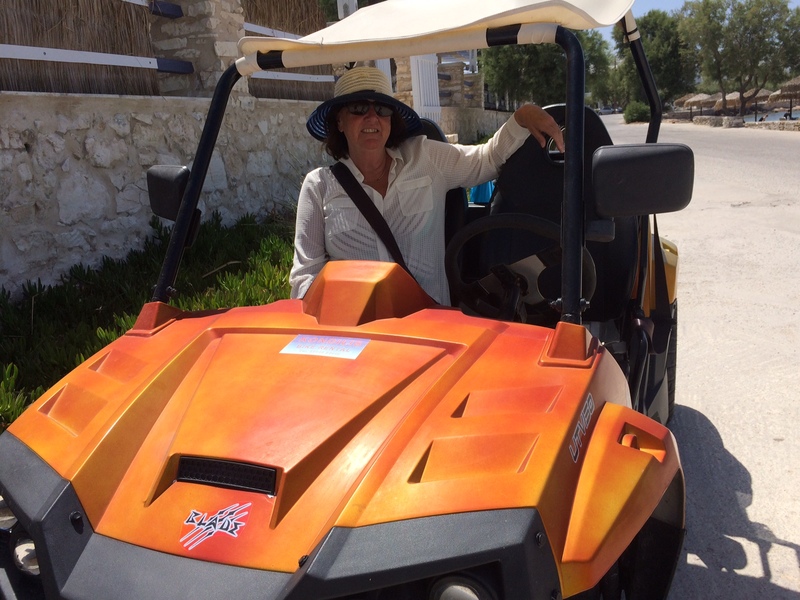 At Paros €4- 15 etc then around €45. Big difference. 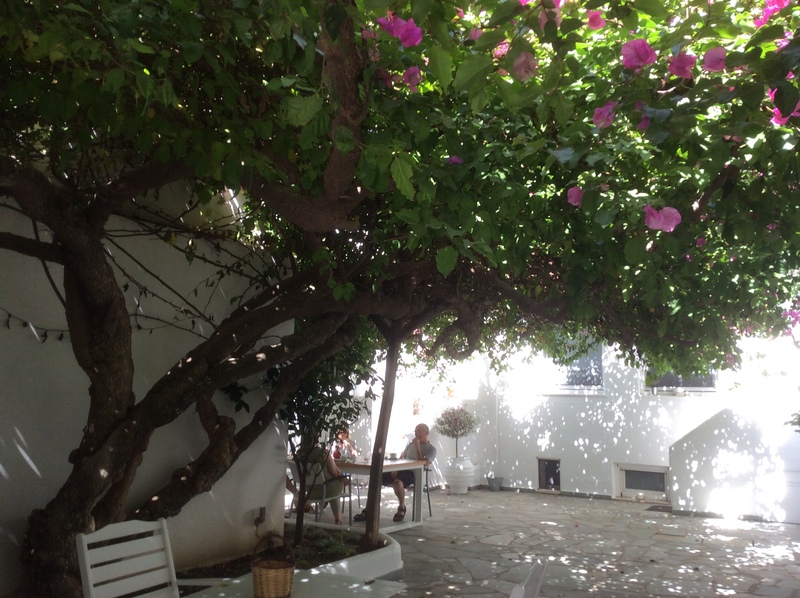 We stayed in room 12 at the Apollon Boutique hotel. Beautifully redecorated three years ago – pleasant balcony – limited breakfast – some of the smaller rooms on the lower floors just have a window and feel very closed in. We think they have the largest bougainvillea tree – Yes – tree in the world. The canopy is 30 METRES by 9 metres! 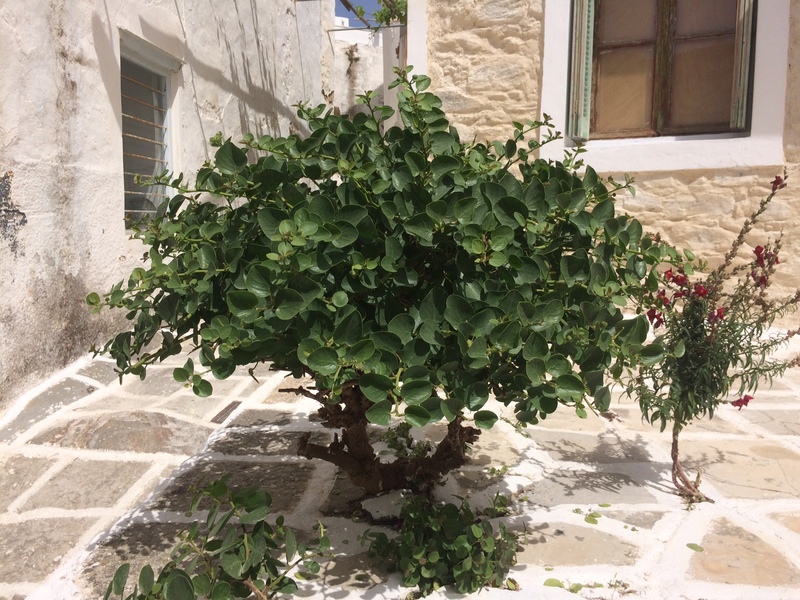 Paros – Apollon – Bougainvillea TREE – not a climber! 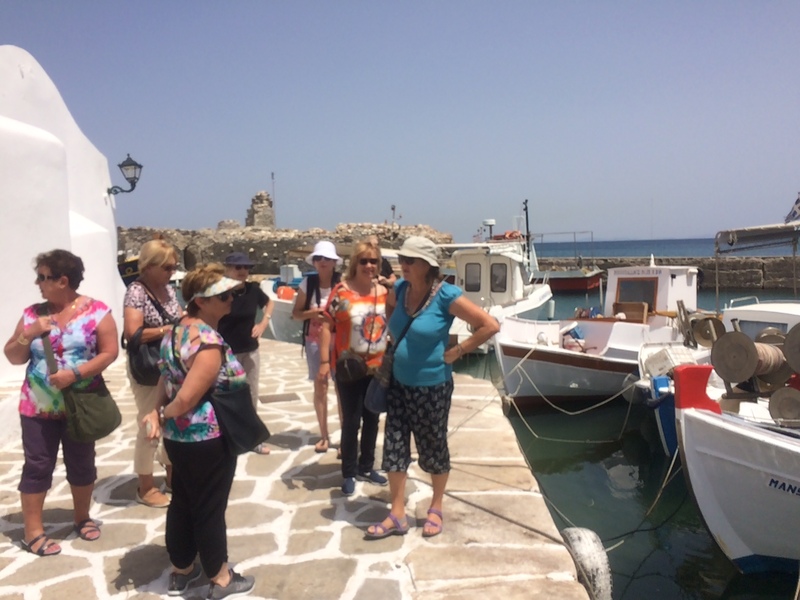 The arranged three hour tour of the island had a tourist guide who came out here in the 60’s, lived in an isolated monastery and rode a donkey into town! They still farmed with horse drawn ploughs and scythed and sickled the crops. Must have been akin to arriving by ship in Fremantle and going to work on a farm in Wiluna! Nowadays most of the terraced crops lie unworked, with the remains of the old walls still visible. We passed a capon tree by the roadside and also saw thyme, rosemary and sage growing wild in the hedgerows. Naussa – such a pretty spot. 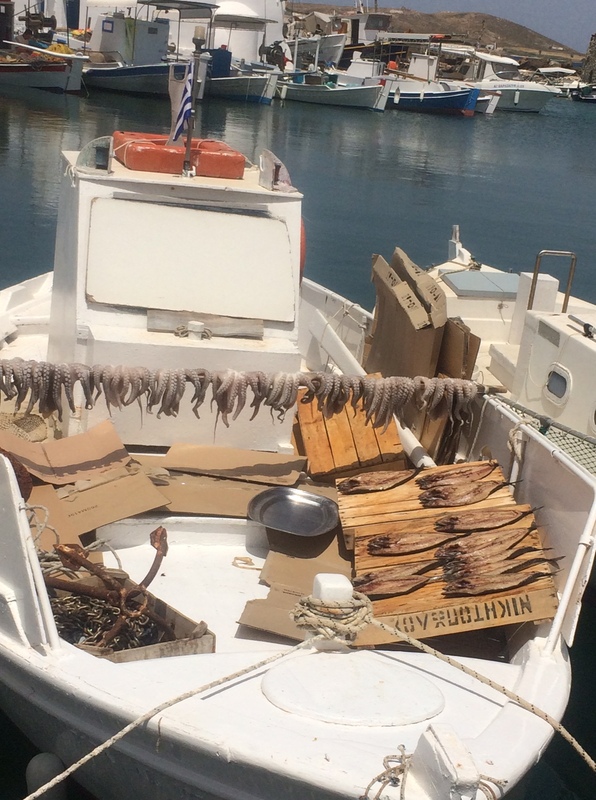 Naussa – mini harbour – drying the catch. Nausea – Venetian fort in background. 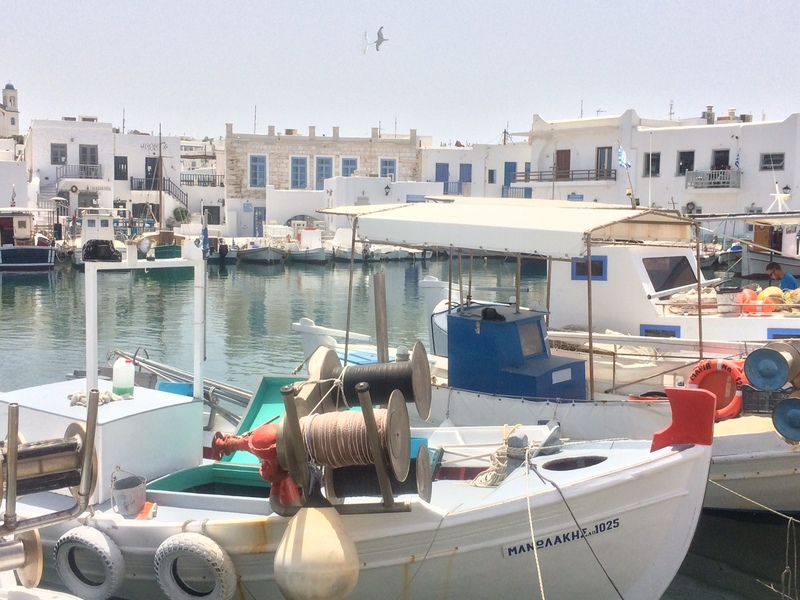 There are some magnificent bays with crystal clear water around Paros. Yesterday we four hired a couple of covered beach buggies and visited the ancient Venetian fishing port of Naussa. The noise. Took us back to our bubble car days in the UK. Great fun – screaming along at 40 mph – guesstimate as totally clapped out and speedo useless. “Automatic” – lurched when going forwards and made a horrible noise when reversing – thought we’d lost the gear box. It was a really hot day – visited her monastery – closed – went swimming – beautiful. Wind in your face, hair in your eyes – for some – cool – in both meanings of the word. 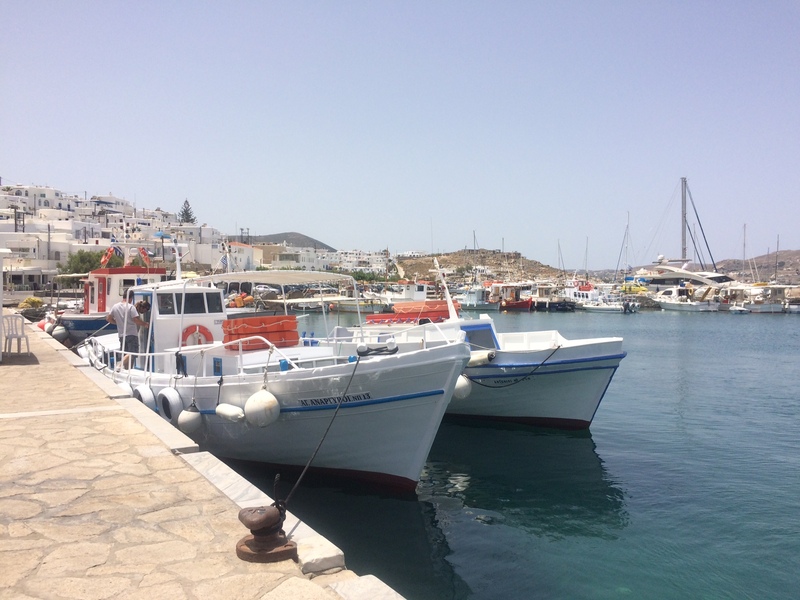 Naussa is the original tiny little port of Paros. Sacked by Barbarossa and stacks of other pirates throughout history, it is still full of the little fishing boats known as “caiques”. 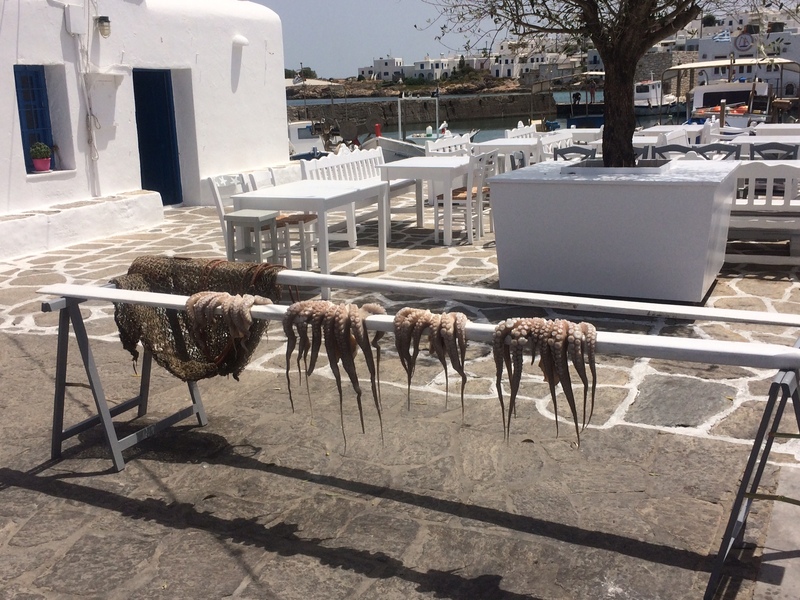 They still hang the octopi and fish out to dry in the sun when they return from their trips. Went snorkelling in the crystal clear waters of the Aegean Sea. 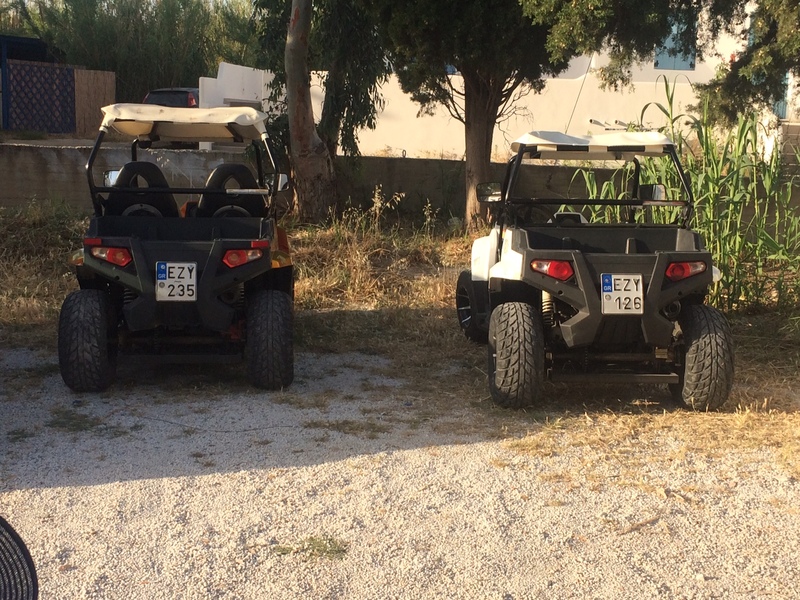 Strolled along the picturesque little village of Lefkis but got back in the buggies pretty quickly as very hot. 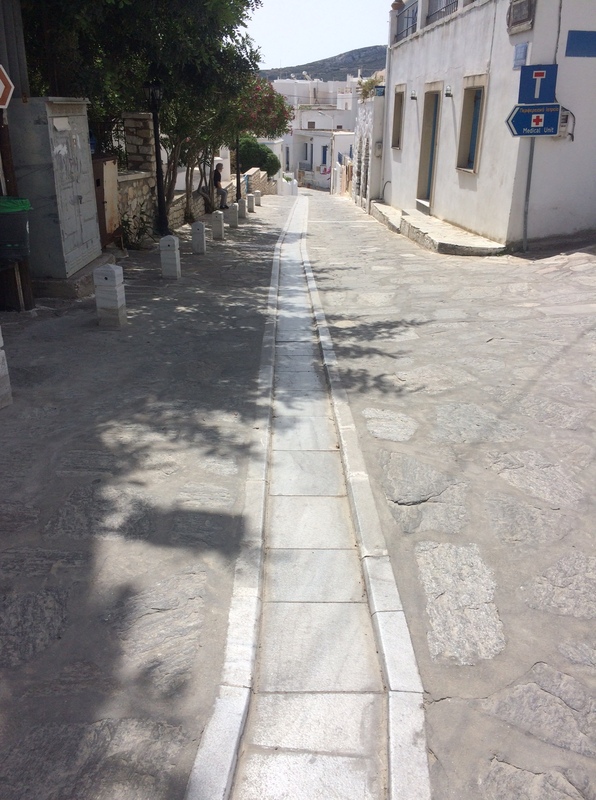 Interesting stormwater disposal system and alleyways still twist and turn but are wider than those in Mykanos. Went out for a meal last night – really cheap. Smoked fish – so salty and heavily smoked – dry – almost inedible. I had meatballs and chips – drowned in paprika – no sauce – yuk. Chris has had three days of lethargy and burning up then freezing. Already had flu this year, so no idea what it was. She is now on the road to recovery. Last night was her first attempt at a meal. Hers was the best – a weird soup. Today we are off to Naxos, the biggest island in the Cyclades. 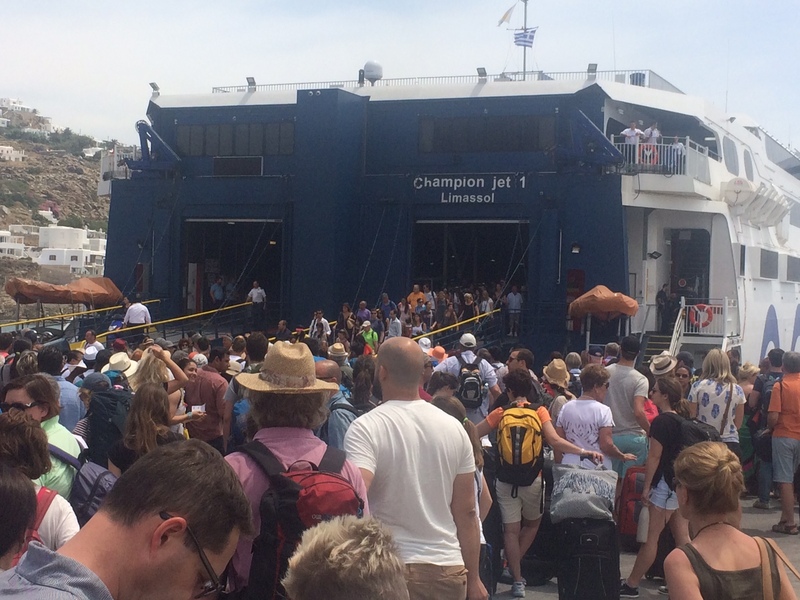 Many of the high speed ferries are made in the Austal shipyards in Fremantle – yeh for the Aussies. Now waiting for ferry to Naxos.